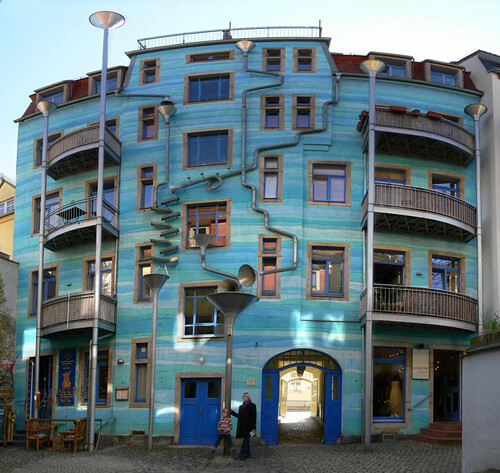 A house façade in Neustadt Kunsthofpassage, Dresden, Germany boasts of an intricate and crazy looking system of drains tubes and funnels which reportedly create music when it rains. The Musical wall was created by its residents Annette Paul (sculptor) and Christoph Rossner and André Tempel (designers). Built in 1999 this amazing architecture has made the location one of the prime spots for the tourists in the city. 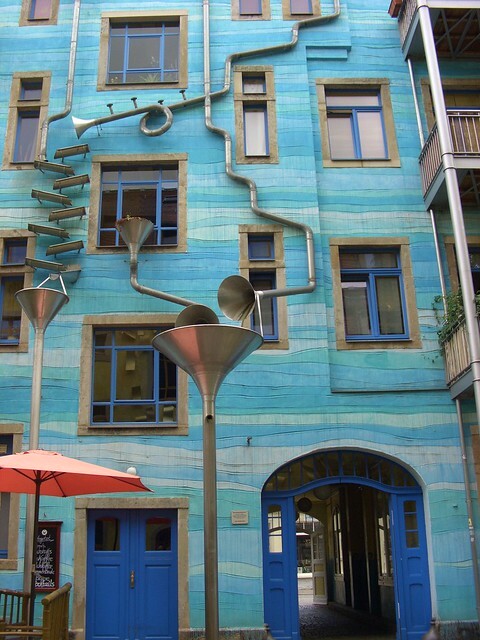 Note: Although many websites have reported that these artfully created drains make musical sound when rain water runs down the drain pipes, but I couldn't find any video/audio file of the actual musical notes created during the rains. In the YouTube given at the end of this post, my non-musical ears couldn't hear any sound of music. I could hear only the normal sound of rain. To me at least the house facade is more of visual art than audible art. Music or not, the façade is one of the coolest I have seen. Note: The rainwater sound starts at 00:50 seconds. Mail Online - "Singing in the rain! 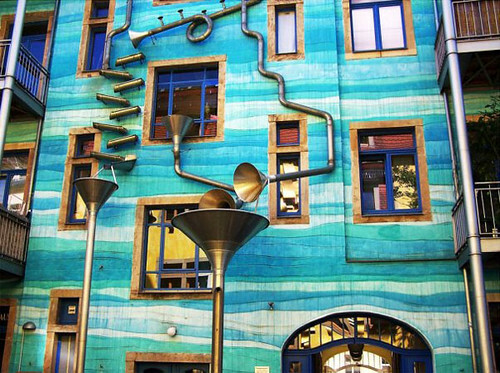 Building that plays music whenever the heavens open..."
Atlas Obscura - "When the rain falls, this drain system turns into a musical instrument." inhabitat.com - "Funky Blue 'Court of Water' Wall Plays Music When It Rains"